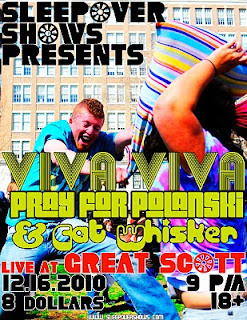 The good people at Sleepover Shows are having us headline their show at Great Scott on Thu Dec 16, with Pray For Polanski and Cat Whisker. The show is 18+, $8 and starts at 9pm. You don't have to bring your jammies and pillow, but if you did, that would be cool with us. Make sure to RSVP on the facebook event page and invite all your friends! This will be our last Boston area show of 2010, so make sure to come out and join us for the party! See you there!